Colin Kaepernick’s protest is working. His quiet gesture was precision engineered to accomplish exactly what it’s accomplished. The 49ers’ Eric Reid and Colin Kaepernick during the national anthem prior to the game against the Chargers at Qualcomm Stadium on Sept. 1, 2016, in San Diego, California. It’s not just an NFL thing. Soccer player Megan Rapinoe took a knee during the anthem. So did a football player at Indiana State University and high schoolers in Nebraska, Kentucky, Virginia, Illinois, Minnesota, and Maryland. All of these athletes are following Colin Kaepernick’s lead. Back in August, Steve Wyche of NFL Media asked the San Francisco 49ers quarterback why he didn’t stand for the national anthem. (He’d done the same thing the previous two weeks but nobody had noticed.) When Kaepernick explained he was protesting the oppression of black Americans, he was widely ridiculed as an ignorant, washed-up millionaire athlete who just wanted attention. Well, one of those things was true. Kaepernick did want attention, and he’s getting it. The guy in the Fidel Castro T-shirt is changing the way we talk and think about sports and symbology and patriotism. The people calling him a dummy are having the conversation Colin Kaepernick wants them to have. Lahren is a one-woman basket of deplorables, a straight-up racist. Her crybaby–mouth diarrhea evisceration included a plea for “those in black communities [to] take a step back and take some responsi-damn-bility for the problems in black communities.” Kaepernick’s other critics, to be generous, got so caught up in feeding the messenger through a wood chipper—he’s rich, he’s entitled, he retweets stuff that doesn’t make sense, his message isn’t as well-sourced as a doctoral dissertation—that they failed to appreciate how his voice would carry. When you’re a multi-millionaire with a platform as an NFL quarterback, gestures—and that’s all this is, is a gesture—is not what you’re called upon to do. He’s not John Carlos and Tommie Smith. Those guys in the 1960s, when they were making gestures, that was all they could do. They weren’t wealthy. They didn’t have the power or the platform that Colin Kaepernick and these modern-day athletes have. What has Kaepernick’s supposedly empty gesture achieved thus far? It’s inspired football players and other athletes to speak up about race and police violence, and to do so in such a way that reporters, fans, and team owners actually pay attention. According to Robert Klemko, more than 70 NFL players, including Kaepernick, Foster, and Richard Sherman, are in a group text talking about “what Kaep started.” That’s not a gesture. That’s a movement. The 49ers franchise announced they would donate $1 million to, in the words of the team’s chief executive, Jed York, “the cause of improving racial and economic inequality and fostering communication and collaboration between law enforcement and the communities they serve here in the Bay Area.” Kaepernick has pledged $1 million of his own money to address the same issues. “I have to help these people. I have to help these communities. It’s not right that they’re not put in a position to succeed or given those opportunities to succeed,” he said. That’s a movement with money to back it up. Just as important, Kaepernick has made his fellow Americans think about what they’re standing for, and why. It wasn’t typical for NFL players to stand for the national anthem until 2009—before then, it was customary for players to stay in the locker room as the anthem played. * A 2015 congressional report revealed that the Department of Defense had paid $5.4 million to NFL teams between 2011 and 2014 to stage on-field patriotic ceremonies; the National Guard shelled out $6.7 million for similar displays between 2013 and 2015. And as the San Francisco Chronicle’s Ann Killion noted, if you think Kaepernick’s gesture is an empty one, you need to grapple with the fact that “standing for the national anthem before a sporting event is an equally empty gesture for many people.” Consider that, as Marcus Peters raised his right fist in Kansas City’s Arrowhead Stadium, thousands of fans interrupted the supposedly sacred anthem to yell out “home of the CHIEFS!” Thousands more jersey-wearing, beer-swilling patriots booed President Obama’s pre-recorded Sept. 11 speech as it poured out of PA systems in Baltimore, Seattle, and New Jersey. Patriotism! If Kaepernick had donated $1 million without the anthem protest, or if he’d stuck to venting on social media, then prominent columnists and TV yakkers wouldn’t be calling him an idiot. Nobody would be saying anything at all, because nobody would care. 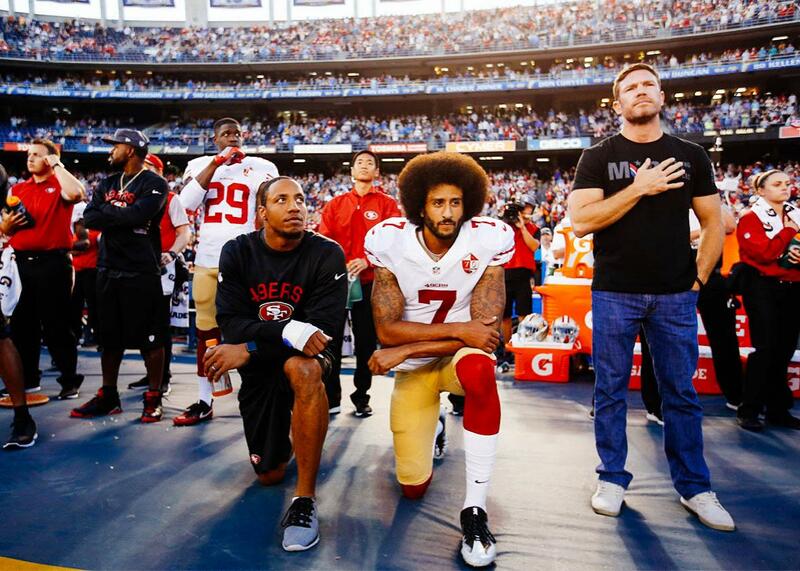 Back in our nonhypothetical universe, an NFL player who happens to be black and happens to play quarterback happened to sit during a patriotic pre-game ritual to protest the country’s racial inequities. Kaepernick’s gesture worked because it was divisive—because his supporters celebrated him for giving voice to the voiceless, and because his detractors amplified that voice by trying to shout it down with ad hominem attacks. His protest, striking at the heart of America’s most cherished pieties from the stage of its favorite sport, was precision engineered to accomplish exactly what it’s accomplished, and the response has only proved its necessity. Who’s the idiot now?